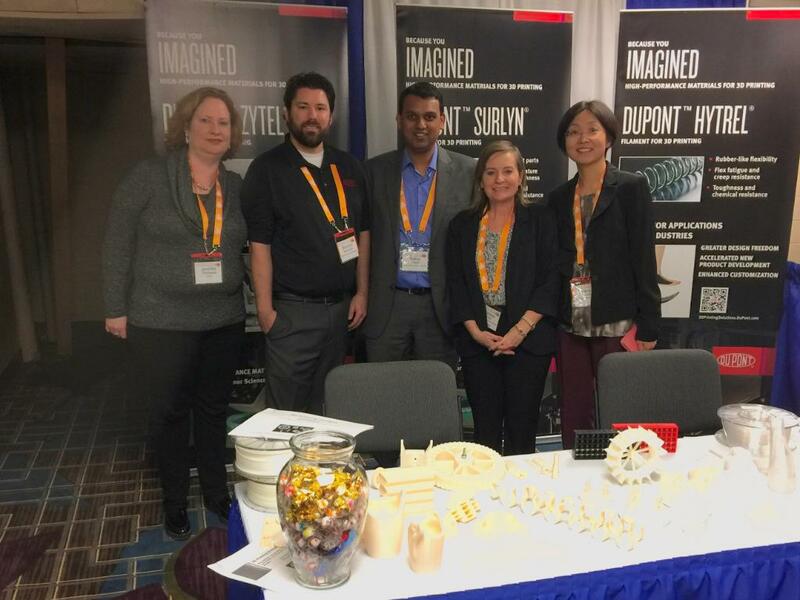 DuPont showcasing the 3D printing materials at AMUG this week. Photo via DuPont. In their pre-existing forms, the company can already demonstrate a number of use cases for the materials. Hytel has been used by the company to create Constant Velocity Joint boots for automobiles due to its advanced durability characteristics. Zytel on the other hand is the name used by DuPont to refer to nylon resin products, such as heat-resisting engine covers. And Surlyn is resin based, finding use as a surface layer for products such as golf balls and perfume bottles. One of DuPont’s competitors, 3M has also recently entered the 3D printing market. 3M has developed 3D printable fluoropolymers in the form of SLA resins. We are very excited about the addition of these new filament-based products to our existing portfolio and the progress made in the launch of these products for the 3D printing industry. We believe these products will help our customers meet their needs for prototyping and manufacturing using 3D printing as this technology continues to get adopted across multiple industries. Adapting these materials into new 3D printing forms demonstrates the attitude of well established material companies. Likewise HP has just announced their Material Development Kit (MDK). The MDK supports material suppliers to develop and certify new powder materials for the HP Multi Jet Fusion 3D printer. Don’t forget to cast your vote in the 3D Printing Industry Awards. For the latest news on 3D printing materials, sign up to our newsletter and follow us on twitter. Featured image shows DuPont’s previous collaboration with taulman3D to develop T-lyne 3D printer material. Photo via DuPont.